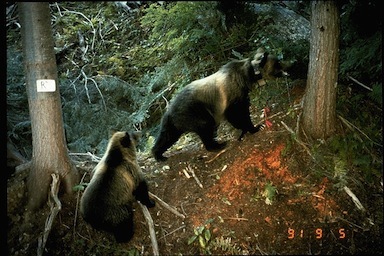 Grizzlies on action cam of a Rockies forest. Image courtesy of USFWS. The US Ninth Court of Appeals recently ruled that Grizzly Bears in the Yellowstone area must remain protected as an threatened species under the Endangered Species Act, because a main food source for the largest mammal of our North American forests is being wiped out by pine beetle and drought, maladies laid at the feet of climate change. Until the US FWS can establish a measure of the threat posed by the complex relationship between the grizzly and its important Autumn food source in white pine nuts, the magnificent predator will remain listed. It’s an example of the depth and complexity of the problem of habitat before us — rapid climate change leading to swaths of dead habitat throughout a region the size of South Carolina, leaving the wildlife of the area without a vital source food at a time of feeding for winter. How do we preserve a forest, a habitat of such size as the Greater Yellowstone Ecosystem, much less an Arctic habitat for the polar bear? The size of change taking place with climate change is truly unfathomable; that it is happening at a rate several times faster than what was predicted should chill us all. But this change is largely out of sight of the mainstream urban populations, thus 37 percent of Americans maintain that climate change is a figment of scientists’ imaginations, a number largely unchanged since last May, in a study by the Yale Project on Climate Change Communications. “A Gallup poll from last month found that Americans rated global warming as the environmental problem they worry about the least,” noted US News in August 2011. Perhaps one of these Americans could explain this disbelief to a starving grizzly bear in the Yellowstone area. Pregnant females are needing to eat high calorie foods, such as the rich nuts of the white pine tree carefully collected into the middens of red squirrels, to survive a winter of bearing their young. The bear is an amazing animal — if the female runs out of sufficient calories while hibernating, her young do not make it to term within her. If there are barely calories enough to carry to term, the female can easily starve while the young are born and nursing as she still hibernates before the spring thaws of the high mountains reach her snow-bound den. The female bear teaches her young where to find food at each time of year, and this knowledge is passed from generation to generation, year after year, ensuring the life of the species as the years carry on. The grizzly is a beautiful creature of muscle, shaded coat and ooh-inspiring cute young; it is easy to how they inspired the old fairy tales of royalty hidden and bewitched inside their golden, brown or white coats. One is blessed to ever get to watch their care of their young in the wild, as I was once honored to spy on an early morning in Yellowstone a decade ago. On an early June morning, a huge brown and golden female gently swatted her two lagging, playful cubs into rolling balls of fur over the far mountain meadowof glistening green grass, potently urging them to stop romping and rush to the safety of the white pine forest before the sun and danger of discovery rose any higher. In such wide-eyes moments, one’s breath stops at seeing — nay, feeling — the wild garden thrive in our ruled and paved world. It is possible to feel more — and finally — at home in this edenic place, among the life and wilds in which we too were planted as a partner within Nature. We come home to wilderness; we must relearn our way on the paths of the forest, and remember what it feels like to be hungry and desperate to feed our young in a habitat that no longer supports us. While our feelings could not be so different than those of that grizzly bear when finding the winter food source is not there, it is also a feeling we share in common with millions of other mammals, including fellow humans. How do we save an entire forest for the trees — and the bears — if we do not even see it or the climate change destroying it? We will be poorer without the bears and the other members of their complex white pine forest habitat, should it or they not survive the rapid change of our shared home planet Earth.